Music is everywhere at GHBC. 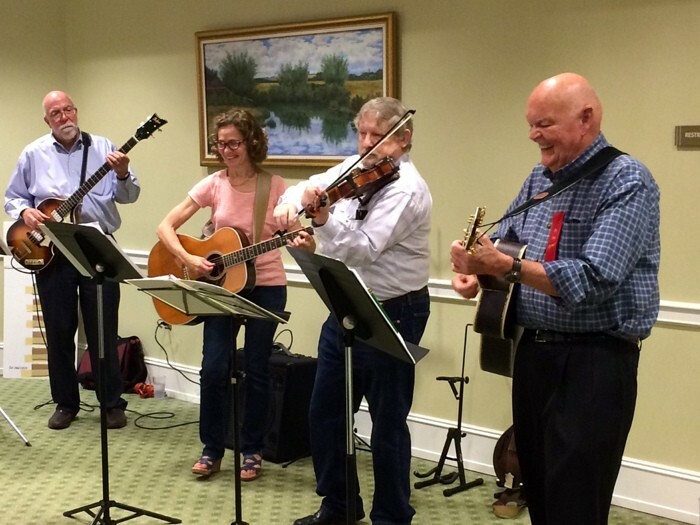 Residents participate in music classes, enjoy performances featuring guest groups and individuals, and residents share their time and talent as volunteers providing music to residents in the Health Care Center and in Assisted Living. An Encore Chorale group rehearses at GHBC Fridays from 1:00 - 2:30 p.m. in the Auditorium from mid-September to mid-December and mid-January to mid-May. The Chorale director presents new music to be rehearsed each “semester,” and rehearsals culminate in a performance at GHBC and a performance with other chorale groups for the public at a local school. Contact: Mandy Whalen, ext. 7534. Thursdays from 2:00 - 3:00 p.m. in the Media Room. After a brief introduction, participants listen to music compositions—from Broadway tunes to Beethoven and Stravinsky, Jazz to Bach. The music illustrates the range of emotions evoked, from joy to sadness, passion to tears. Contact: Ed Eisen, ext. 7487. A five-piece group, which includes both residents and non-residents, plays fiddle and dance music of Appalachia and popular folksongs. They perform during Happy Hour in the Lounge area on occasion as well as at events such as the opening of the Employee Gift Fund. In addition, they perform outside GHBC. Contact: Hank Lewis, ext. 3179. Saturdays at 1:00 p.m. in the Media Room. Residents gather to watch high-quality full-color opera productions. A written synopsis of the opera is available for members of the audience before the opera begins. Contact: Ed Eisen, ext. 7487. Occasional evenings after dinner in the JDR. Talented pianists, both residents and volunteers, sit down at the piano outside the Jefferson Dining Room after dinner (approximately 6:15) and play popular music from the 30s, 40s, Broadway, and dinner guests are welcome and encouraged to sing along. Drop in. Fourth Monday of each month from 7:00 - 8:00 p.m. in the Formal Parlor. 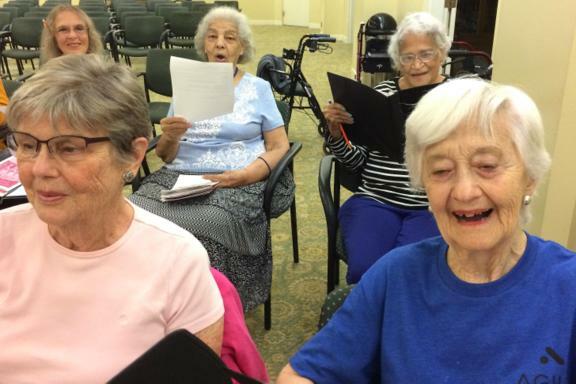 Residents are invited to sing with SHINE singers, a group from the Unitarian Universalist Church Of Arlington. Contact: Resident Services, ext. 7222. Wednesdays from 4:00 - 5:00 p.m. in the 3rd floor living room. Join residents of Assisted Living on the 3rd floor for a sing-along of popular show tunes, folk songs, and patriotic songs. Lyrics provided. Fridays from 4:00 - 5:00 p.m. in The Terrace. Join residents of The Terrace on the 3rd floor for a sing-along of show tunes, folk songs, and patriotic songs. Lyrics provided. Third Thursday each month at 4:00 p.m. in the Recreation Room in the Health Care Center. Check the monthly schedule on the Health Care Center Activity Calendar on the website to confirm. Contact: Hank Lewis, ext. 3179.